Tired of having charging bricks blocking your power outlets? 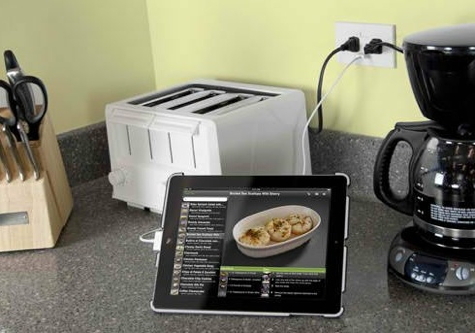 Most of us have a crowded spot in the kitchen or living room where we charge our iPhones and iPads. NewerTech has a solution, Power2U. This outlet replaces one of your power receptacles and provides two USB sockets in addition to the two standard USA 110V power outlets. The power supplied by the USB outlets is technically 5.2V DC, 2000mA (10W). This is equivalent to the output of an Apple iPad power adapter so that the Power2U will charge iPads, iPods, or iPhones. To save power, the USB outlets are only powered when their covers are open and a cable is plugged in. This patented, UL listed design allows you to plug in two appliances or lamps as well as two iDevices for charging simultaneously. You won’t need your charger bricks at all. The Power2U is available in White, Almond, Ivory, and Black. Be forewarned, there are some less expensive look-alikes that are not UL approved. The Power2U is fairly large because of the electronics involved and must be installed in a 120V/15A wall box that is 16 cubic inches or larger. Some household electrical boxes are too small for this. 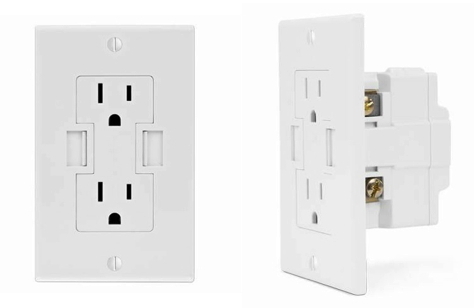 There is a workaround: if the outlet you want to use is too shallow, hardware retailers sell an Outlet Box Extension that increases the depth of the outlet by extending the faceplate into the room by about an inch. Other than the size limitations of some outlet boxes, the Power2U can be a great help as it frees up your available power outlets. At the same time, it eliminates the proliferation of charger bricks that plague those of us with several iDevices.